Buy two kilos of cherries at the local market, so cheap! 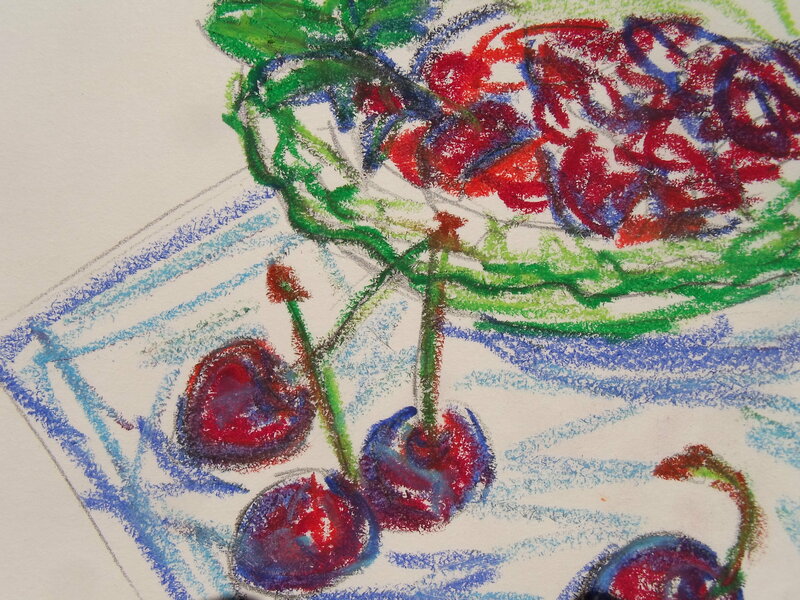 Remember that you are only one person and cannot eat all the cherries. Stone a kilo of cherries. Wish you had asked for a discount because of all the stones. Put cherries in large saucepan. Admire scarlet-stained hands, briefly pretend to be Lady Macbeth, or a character from Scandal. Re-evaluate recent culture consumption. Teach flatmate the word “macerate.” Go running with her in the sunshine. Discover free sparkling water fountain near your house. Rejoice. Come back from run, find a jar of ginger juice in the freezer. Drink it, grateful to your past self, while heating cherries. Let the mixture bubble gently for five or ten minutes until cherries are the desired degree of done: soft but not totally collapsed. Serve warm with mascarpone and meringues for an afternoon snack. Serve cold over yoghurt for breakfast. Especially good with soft, mild goat’s cheese. Use the syrupy cherry juice leftover to make jelly: for every 100g juice, soak 3g leaf gelatine in cold water. When the the gelatine is soft, stir into the warm (but not hot) cherry juice to dissolve. Pour into little cups or pots. Leave to set in the fridge. Or just use the juice for cherry-mint cocktails, add vodka or gin, more mint leaves and free sparkling water. What a great way to use cherries. Your mint- cherry jelly sounds delicious , it has less sugar than the jellies made with pectin. Hi Gerlinde! It’s a British jelly – not a jam. That’s why it is light in sugar. To be eaten as a dessert, not for spreading on toast!